That is really good for a piece of software released less than seven months ago. The years long effort into making upgrades easier and more reliable are paying off nicely. When I looked at PHP and MySQL version usage that is where things got strange. I know that PHP upgrades at some hosting providers happen at a very slow pace, but I didn’t fully appreciate how slow. 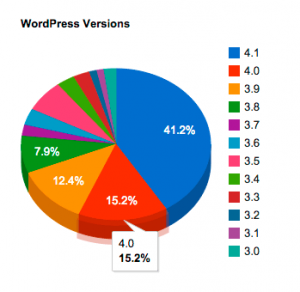 The most reported MySQL version for active WordPress sites is 5.5, at nearly 60%. 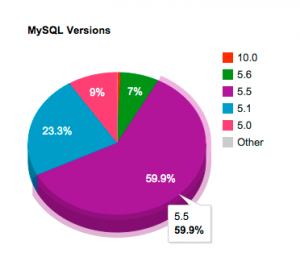 The first MySQL 5.5 General Availability release was two years ago ( February 2013 ). Considering how sensitive data storage is I’d consider that a good upgrade rate. Turns out to be significantly faster than PHP. Less than 47% of active WordPress sites report using PHP version 5.4 or newer. 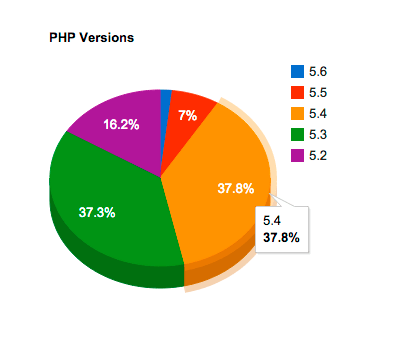 The first release of PHP 5.4 was three years ago ( March 2012 ). I could see not wanting to upgrade on the initial release, so I’ll discount that to two years with PHP 5.4.13 in March 2013. That still leaves PHP 5.4+ at 47% compared to MySQL 5.5+ at 66%. I didn’t expect to see hosting providers upgrading MySQL faster than PHP. MySQL doesn’t have the same history of upgrade breakage that PHP does. Not judging, just saying. Also, note that w.org’s stats reflect our site reports, not “hosts”. Popular hosts with lots more sites are overrepresented by nature. Skewed towards users, not exactly a perfect representative sample. But, the skew is the same across both measurements, so your result is valid. It may be as simple that ( though the effort isn’t really simple ).